On the somber anniversary of September 11th, you have the opportunity to spend an evening of reflection and remembrance with other community members. Write a message in the Keepsake Journal, enjoy light music and share a quiet moment to remember and honor those who were lost during this unimaginable national tragedy. 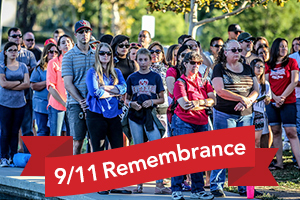 The September 11th Remembrance is 6 p.m. – 7:30 p.m. at the Temecula Duck Pond. This entry was tagged audie murphy ranch, audie murphy ranch new homes, brookfield residential, City of Menifee, Menifee Events, menifee real estate. Bookmark the permalink.